With national cereal production estimated at over 4,650,000 metric tons, there is sufficient food availability at the country level to meet local consumption requirements assessed at 4,560,000 metric tons, leaving a marketable surplus of more than 88,000 metric tons of cereals. However, estimates by the Ministry of Livestock services on available pastoral resources fall well short of the pasture needs of livestock, whose physical condition and market value could deteriorate, negatively affecting the incomes of pastoral households in certain pastoral areas by February/March 2016. In addition to accelerating the rate of population displacement and contributing to atypical food assistance needs for affected households, the security crisis in the Diffa region has significantly limited trade flows and volume of crop production, with reduced area planted due to restricted access to cropland. With the exception of the Diffa region where civil insecurity is driving acute food insecurity, in general, all other parts of the country are experiencing Minimal (IPC Phase 1) acute food insecurity. The severity of acute food insecurity in certain pastoral areas of Tillabéri and Zinder will reach the Stressed (IPC Phase 2) stage between January and March 2016, fueled by the poor terms of trade for livestock-cereals. Official figures released by the Government of Niger put projected cereal production for the 2015‐2016 season at 4,651,123 metric tons, exceeding household consumption requirements by a margin of more than 88,000 metric tons. This crop production figure is on par with or slightly above the five-year average, however it is below the figure for 2014, which was over 4.8 million metric tons. This drop in production against last year is due primarily to localized below-average rainfall, with Tillabéri, Diffa, and Zinder the most affected areas. However, carry-over stocks, good cereal availability in certain areas, and projected imports from neighboring countries are expected to cover most production deficits in these areas. In general, the cereal balance sheet for the country should be met. At present, cereal price levels and trends are in line with the norm, with prices moving downwards with the beginning of the harvest to levels below seasonal averages, particularly in the Maradi, Zinder, and Dosso regions. This should help improve market supplies in deficit areas and keep prices stable in all parts of the country. With the anomalies in the progress and outcome of the growing season and in trade flows to the Diffa region, prices in this area did not come down at harvest time, nor have sharp increases in prices been seen. Poor households in most livelihood zones have typical levels of incomes from scaled-up self-employment activities such as the sale of hay, firewood or charcoal at average prices. With the below-average levels of cereal prices, the net effect of these opposite trends on household purchasing power and food access should be positive. Terms of trade for cereals against wages, hay, wood, and livestock are also helping to promote good food access. In general, pastures and animal watering points are not in any condition to meet the annual needs of livestock for food and water, particularly in pastoral areas of Tahoua and Maradi, though the effects of these deficits on the physical condition and market value of livestock are not yet perceptible. However, there could be visible shortages of pasture and water in pastoral areas by March/April 2016, where livestock unable to get enough to eat on their own will require feed supplements purchased on local markets. The various food security assessments conducted since November 2015 based on the Household Economy Approach (HEA), by the Cadre Harmonisé, and by the National Early Warning System all show similar results indicative of a generally stable food security situation with Minimal (IPC Phase 1) levels of current acute food insecurity with the help of existing food stocks and harvests of cash crops, except in the Diffa region where household food consumption is limited by poor food availability and access as a result of the ongoing conflict with Boko Haram. The current situation and assumptions are in line with the projected food security outlook for October 2015 through March 2016. The availability of irrigated crops over the three-month period from January through March 2016 will help improve food consumption and dietary diversity and strengthen the incomes of households selling fruits and vegetables with typical yields of market garden crops selling at average prices. However, the increasingly limited availability of pasture will weaken the physical condition and decrease the market value of livestock by February/March 2016 to the detriment of pastoral households faced with unfavorable terms of trade for their livestock against cereal prices. Prices for cereal crops are expected to begin increasing as of February, fueled by the usual increase in demand from traders, government agencies seeking to replenish national security stocks, cereal banks and, before long, from households having depleted their harvest stocks. 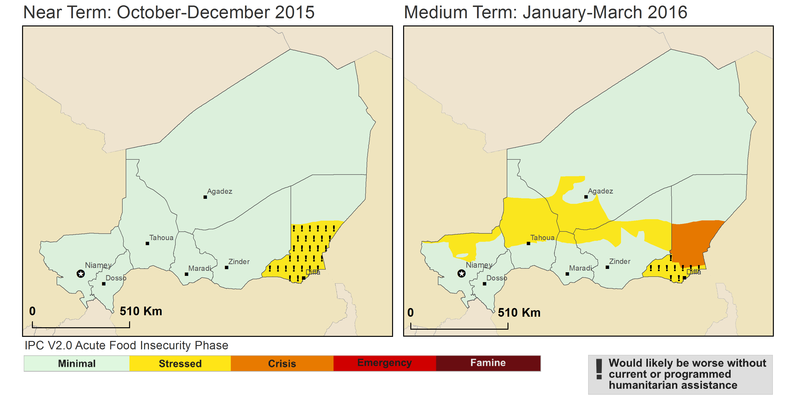 Between January and March, pressures on the livelihoods of pastoral households affected by pasture shocks will lead to Stressed (IPC Phase 2) acute food insecurity outcomes in certain pastoral areas of Tillabéri, Tahoua, Agadez, Maradi, and Zinder. Food insecurity in certain agricultre and agropastoral areas of Tillabéri and Zinder will also be Stressed (IPC Phase 2) during this period. There are continuing security problems in the Diffa Region. Large numbers of local households are reportedly being displaced, particularly in the Bosso and N’Guigmi areas. The north of the Region will remain in Crisis (IPC Phase 3) between January and March 2016, with market disruptions limiting access to food and income. A larger presence of security forces in Diffa, Maine Soroa, and Goudoumaria departments should help displaced and poor resident households improve access to some form of assistance to help meet their food needs. The southern part of the Diffa Region is expected to remain Stressed! (IPC Phase 2!) between December and March 2016.